This is a guest post by Laurey Bennett-Levy, a dear old friend who lives in Los Angeles with her husband and two beautiful daughters. An early supporter of the52weeks, she was inspired to go drumming recently — although if you ask anyone that knows Laurey she has always been one to try new things! This blog is all about trying new things, facing fears, shaking it up — even for Laurey! She welcomes all comments. I am a Bohemian PTA member. Sort-of earthy, sort-of yuppy. I’m a graphic designer/artist type so the term “bohemian chic” really resonated with me when that expression came out some years back. I always said I would never be a typical “PTA-mom”; yet, despite my best efforts I continuously find myself struggling to not be that “type” of woman as I get pulled into meeting after meeting at school. Thankfully, though, I’ve made some fabulous friends there who make it all better. Recently I have also met some new friends who are forcing me to try new things — a la 52 weeks-style. 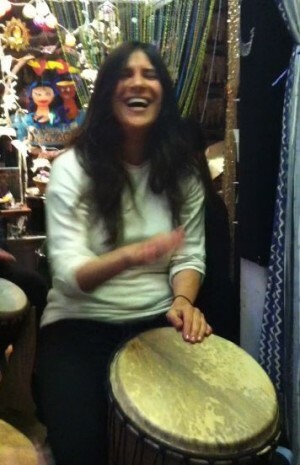 The other night I was taken to an African Drumming Circle. Perfect for a psuedo-Bohemian gal and a perfect way to make sure I was not totally transforming into a PTA mommy! I jumped on the chance to try something new. The “yuppy” side of me needed to relax so I started with a shot of tequila, although it didn’t help much — I still had my guard up just a little. But then, I actually started really relaxing. Hitting the drums, feeling the music, downbeat by downbeat I started to really fall in love with the evening and the people who were free and loving. Here’s what captivated me, besides the love in the room: As moms, we are juggling everything all the time. I tried yoga and could not calm my thoughts of all the 5,000 things I had to do that day, that week, that month. Drumming allowed me to focus on one thing only: the downbeat. I actually FELT the downbeat, the rhythm, and thought of nothing else. I was transported to a meditative state….the kind of state I have never felt before unless I was painting. My eyes were closed and when I opened them after 8 minutes or so and adjusted to the light, I saw that my friends were all in the same zone, doing the same thing. Most of all, it was just fun. The healing power of the drumming is all about rhythm. Rhythm itself has the ability to loosen, free and set things in flow. Rhythm is flow, by definition. Playing or dancing to pleasing rhythms helps the mind and body reach a state of flow (a zone in which a succession goals or activities are being accomplished effortlessly). The most powerful healing effects are from drum circles. The increased number of drums creates a synergistic effect in which the whole is greater than the sum of its parts. When players in a drum circle play with skill the variety of timbres, rhythms, harmonies and so on induces healing. In addition, drum circles are design to be improvisational. The improvisational element also stimulates release, flow and healing. The polyrhythmic quality and improvisational structure of drum circles help to make them a joyous and potent healing experience. Previous post: Rise and Shine!